In the early days of a software market segment people building new software often try to be all things to all people. The segment is usually growing fast and the idea is to meet as many market needs as possible. But as a segment expands, becomes more competitive (sometimes fiercely competitive) and eventually matures, the situation often begins to change. A platform is software that is aimed primarily at being a building block for other software tools (applications) to build upon or attach to. It may include some software applications in its functionality, but its value is providing base functionality for other software developers to build upon. An integrate suite is a set of point applications combined most often using a common user interface. It may or may not serve as a platform to integrate 3rd party applications. I’d like to point out that these terms can be applied to software built in many form factors, whether traditional on-premise, SaaS, mobile, etc. For example, while many SaaS applications started out as point applications, a number have evolved into integrates suite or major platforms, with SalesForce being the most prominent. The most important thing for a point application is providing a great end-user experience (which puts the focus on creating a great UI). You’re trying to be the best at solving a very focused problem–often centered around a particular business process– in the most user-friendly way. As mentioned above, this must include a great user interface. As a result, software companies building successful point applications almost always have a preponderance of skilled front-end developers in the company. Integrated application suites are similar, except you’re trying to attack more than one business function required by your target vertical market. There may also be some integration capabilities included in the application (and sometimes this is important), but this integration functionality is secondary to improving the ability of the end-user target to work more efficiently the area(s) that the application targets. If you don’t get the functionality and the UI right, you won’t live to fight another day. But if you think you might aspire to someday transition to a platform, by all means build in some integration capabilities and even a full API. Well-conceived point applications enable a tightly focused marketing/sales program concentrating on an easily identifiable customer profile, as well as secondarily on a well-developed channel partner profile (if one exists). When well executed this business model should minimize expenditures on sales & marketing. 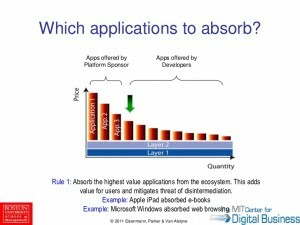 Platform business models look very different from those of point applications or integrated suites. On the technical side, while it’s always good to have a great user interface, with a true software platform this is secondary to the powerful underlying functionality and integration capabilities. 3rd party developers will use this underlying functionality and build upon it rather than “recreating the wheel”. As a result, in platform companies the technical premium is on back-end developer skill sets rather than the front-end capabilities more important in a point application. The defining attribute of a platform is a robust API which enables tight coupling with point applications on data exchange, functionality access and UI integration. In fact, that API is usually crucial to the success of a platform. 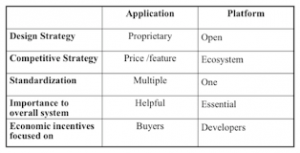 The marketing model for a platform is also very different from a point application. The marketing and sales emphasis is on developers and often channels rather than end users, as is the case for point applications. The key to success for a platform is to get other developers to write applications for/or connect applications to your platforms. So your target market profile might be other commercial software developers, VARs, systems integrators or in-house enterprise developers. But with the focus on developers rather than end users, both the product functionality and the marketing and sales execution for platforms is quite different than the typical point application. Lastly and most importantly, the real gotcha in building a successful platform business is that it falls into the classic “which comes first, the chicken or the egg?” category. Developers are attracted to write applications for platforms which already have a tremendous number of end users, but to attract tremendous numbers of end users you need a large number of applications written for or connected to your platform! This is a similar marketing issue to the “network effect” faced by many Internet-based businesses such as social media. The result is that it’s very difficult for a startup to create a platform company from scratch. Many have tried, but most end up failing miserably. They often aren’t able to attract a critical mass of either developers or end-users to their platforms. There are exceptions, of course, but the examples are few and far between. 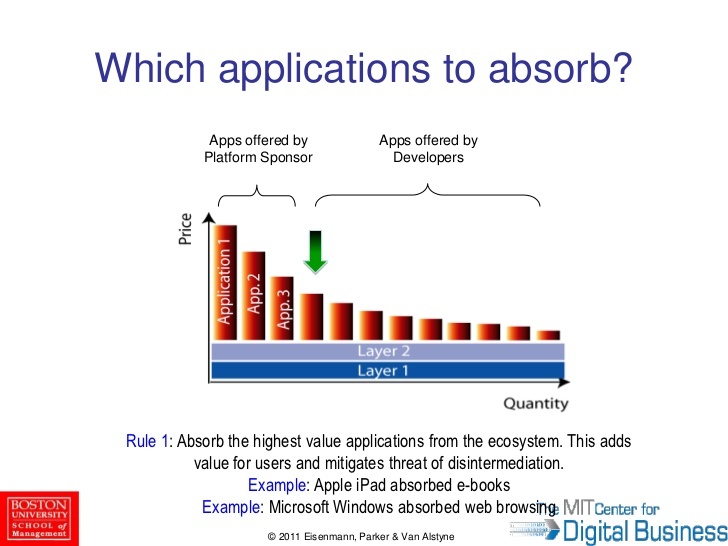 It’s much easier for a vertical (point) application developer or integrated suite developers who already have market traction to add platform features and make a more gradual transition to a platform player. The only case where success creating a platform from scratch is more likely is when a large, integrated software giant with huge market presence decides to enter a platform business. In the long run as a market segment continues to mature the changes don’t stop. One of the initial changes is the desire by market segment end-users to integrate together the various functions important to the market segment which may have initially existed in their own silos as point applications. This may occur initially via one-to-one integrations between point applications. The next step is often the rise of integrated suites and finally integrating platform software, sometimes sprouting from a successful point application and other times from a well-known industry giant. Finally, and usually occurring by the time growth slows, flattens or even becomes negative the segment enters the final phase: consolidation. This takes place because investors by this time are no longer willing to fund the secondary and tertiary players who have no obvious ways to survive–or at least thrive–as standalone companies. In addition, even the companies who are “winning” face dramatically slower growth. Most “growth” companies want to continue to grow (whether that’s always a good idea or not will be the subject for another article) so these winners are faced with two choices: diversify into other markets or buy their less successful competitors. Often this takes the form of becoming a “platform” player buying up point applications to create a “one stop shop” application suite solution to meet market needs. What I’ve portrayed here is just one scenario about how the life cycle of a software market segment evolves. Obviously every situation is different, but I’ve seen something very similar play out many times over a wide variety of market segments. What’s the takeaway? If you want to maximize your return to your investors, it’s important to know “who you are” as a software company. Take a realistic inventory or your resources and capabilities and where you fit best over time in your market segment. Don’t bite off more than you can chew and be ready to proactively transform you business and play your optimal role in industry change and consolidation at the most advantageous time for your company. That’s my take on software market segmentation with respect to platforms and applications. What’s your view? Post a comments below to fill us in on your thoughts. Things change, and that’s the nature of life. Software will always become outdated as business needs evolve. I think the world gets it. I also think there’s a scramble to find the platforms, applications and software that can manage the software development life cycle. Change happens too quickly in the IT world. There are standards in place, across every industry that are establishing protocols to manage the frequency of this change. It’s an attempt to bring a little order to the chaos.